Went to the local healthy food store and got an assortment of gluten free flours (white sorghum, brown rice, teff, millet, tapioca) and xanathan gum. 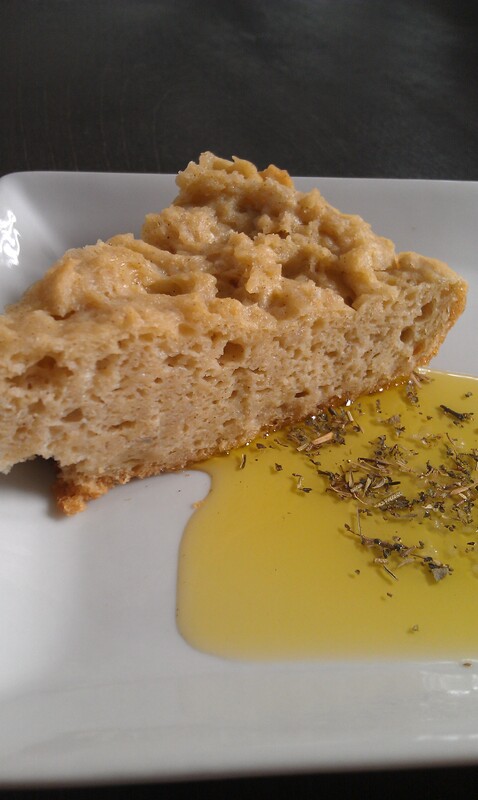 Now I don’t plan for these to be daily ingredients to add to my repertoire since they are still high carbs, grains, and really how unprocessed is xanathan gum….But I decided to experiment for those occasional bread cravings. This was a win! 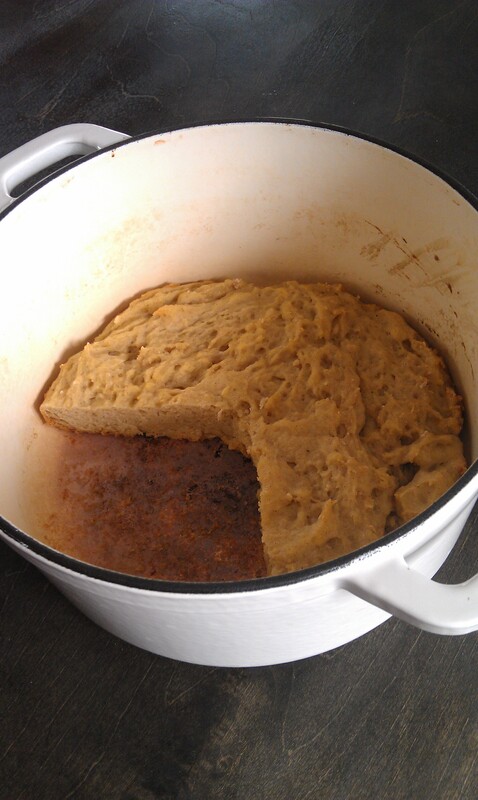 I looked a little funny, in the dutch oven when i took it out, Didn’t rise as much as I expected and didn’t brown on top….but when I cut a slice out….the steamy and the yeasty smell oh I was won over. Even my husband took a peek and said that looks like bread (yah I was surprised too :)) It was crusty on the bottom with nice yeasty holes, nice soft doughy inside. I took a bite….handed him his favorite part the inside and he said “this tastes just like a baguette”….I might get my wheat eating husband to go wheat-free yet with bread like this. This is better than any traditional bread I have ever made. THe reason for baking it in the dutch oven with the lid on is for the steam to help create a crusty top. Well as you see in the picture…no crusty top and really flat bread due to it spreading out to fill the entire bottom of the dutch over. Next time I will probably try a small container to help it rise up a little taller and go without enclosed cooking container. To store I just let it cool most of the way with the dutch oven lid off so steam wouldn’t collect and then covered the dutch oven while it cool completely to make sure it didn’t dry out. Serve with grassfed milk butter, olive oil with some italian seasoning and seasalt….or make a grilled cheese sandwich yum, yumm, and yummmmmmm. Day 2 Update: The bread was equally good the second day as the first which I’m pretty surprised by I thought it would get hard and chewy. I wrapped it up well and put it in the fridge to make sure it didn’t mold. But terrible gas this bread gave me…oi it might as well have had wheat in it. I think it must have been the xanathan gum…will have to experiment with guarguar gum.